Dave on Leave injured wildlife alone?! On what planet??? Shelley Whittington on Leave injured wildlife alone?! On what planet??? It’s a beautiful morning in the summer of 2008 and I’m driving with a friend and her two dogs on Highway 12 into Crested Butte, Colorado, after an overnight at the Lake Irwin Campground. There’s activity in the road ahead, in the shadow of overhanging trees. I slow down. It’s animals. Birds. Small ones. On the road. Reaching the scene, I see two young birds flitting about the flattened bodies of three others. I pull over, grab a towel from the trunk and quickly survey the situation. Two of the dead are adults – likely the parents. The other is young and, like the survivors, probably the offspring of the adult pair. The pummeled bodies indicate this scene has been playing out for several hours. The fledglings are panicked and exhausted. They’ve been dodging the vacation traffic for some time, moving back and forth from the side of the road to the bodies, their parents the only touchstone they have ever known. Despite my cautious approach, one of the fledglings keels over, dead. Thankfully, I capture the other and get her safely into my car. As would be the case with so many of you at this moment, my sadness at the tragedy is matched by my resolve to do my best to help the little survivor tucked into a towel in my lap. She deserves a chance to fledge, a chance to fly. She deserves it especially because her siblings never will. Especially because her parents likely died in an attempt to save her life. Especially because this tragedy is the result of a road being built through her neighborhood by my forebears. Because this tragedy is played out a million times a day on roads throughout this country, and people don’t even slow down. Especially because flying is her birthright, a compact with this planet’s inconceivably complex and lengthy evolutionary history to take her hollow bones airborne, above and through the aspen, spruce and pine. To bask in the warm alpine summers and cuddle up with a partner through the cold white winters. To raise a family of her own. I spend the next hour in Crested Butte looking for help, which is difficult enough without my traveling companion holding firm to the idea we should have “let nature take its course,” notwithstanding my objections that nature doesn’t build roads through a forest and drive SUVs. I finally track down a veterinarian at a gym. She probably needs a healing workout as much as I need help with a bird, but she acquiesces and agrees to meet me at her clinic. There, she takes the bird and promises to do her best to care for her. And I drive away. That was kind of the trigger for me on this whole Animal Help Now thing. I’m one of those people whom injured and distressed animals throw themselves in front of. If you’re one, too, you know what I’m talking about. 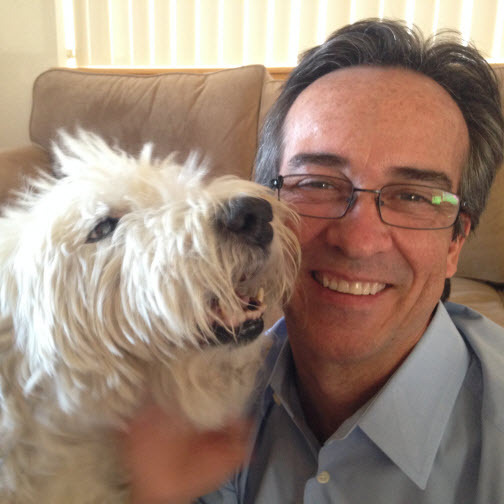 I’ve probably encountered 60 animal emergencies during my 25 years in Colorado. Ducklings stranded in the median on Highway 36. A prairie dog lost and imperiled in urban Boulder. An injured butterfly on the road in Coal Creek Canyon. A cat on a telephone pole in the alley behind my house. An injured, scared dog running loose for weeks in my neighborhood and the surrounding open spaces. A rattlesnake on Highway 93 near Golden. An injured goose, a poisoned pigeon, a paralyzed squirrel. Dave and his beloved Sadie. When I was in or near Boulder, I pretty much knew where to go for help when I encountered these emergencies. Though of course in some cases, you do your best on your own. I’ll tell you the rattlesnake story another time. It has a happy ending. When I was away from Boulder, however, I had no idea what to do with most of the animal emergencies I encountered. And this little bird in Crested Butte was the proverbial straw. The lack of an emergency, 911-type service for animals – and for wildlife, in particular – was even more evident at my day job, working with Rocky Mountain Animal Defense. Almost every day we would get calls from people who were trying to help with this or that animal emergency. And here they were, seeking guidance from the person who’d tracked down a vet in a gym. Sure, it worked for me, but not everyone has that kind of compulsion or time, or luck. The fact is – and I’m confessing I didn’t know this, despite my position working in the upper levels of an animal advocacy organization – there are a lot of resources available for people who need help with injured ducks and orphaned rabbits, distressed deer, even stranded dolphins. Not enough, mind you, but a lot. Thousands of home-based wildlife rehabilitators dot the United States from coast to coast, each tending to wildlife emergencies in her or his backyard. More than 250 wildlife rehabilitation centers can be found throughout the country, with one in DC and at least one in 46 of the states. Thousands of veterinary clinics treat at least some types of wildlife. Marine animal hotlines cover the entire US coastline, and well over a dozen wildlife hotlines cover areas ranging from cities such as Dallas to entire states. So there it is: A massive community of people looking for help with wildlife emergencies, and a substantial community of people who can provide such help, … and no apparent service to connect the two. Or there it was. Because that’s what Animal Help Now does – It connects people who need help with wildlife emergencies with people who can provide help with wildlife emergencies. Coast to coast. In many cases, 24/7. In Colorado and Texas, Animal Help Now also covers the full range of domestic animal emergencies, directing you to help when you find a lost pet, need an emergency vet, witness animal abuse, etc. 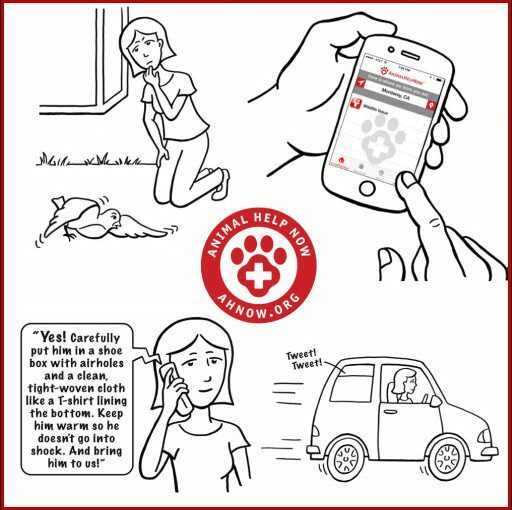 Animal Help Now also helps you prepare for animal emergencies, determine if an animal really needs your help, properly capture and transport animals, etc. On behalf of the whole team here at Animal Help Now, thank you for reading. We are excited to have you along for the ride.